The choice, though widely lauded, has its critics as well. Although the subjects Yan typically writes about are “non-political,” the writer has been embraced by the Communist Party, something that gives dissident writers and others pause. Despite political concerns, few would argue that Mo’s work is not brilliant. His subject matter typically examines rural Chinese life through magical realism. Mo’s penchant for narrators like talking animals and his inclusion of elements from Chinese fairy tales has drawn comparisons of his work to that of Colombian author Gabriel Garcia Marquez. 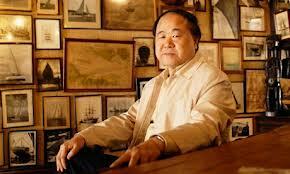 Perhaps Mr. Mo’s best-known work in the Western world is his novel Red Sorghum. Published in 1986 and translated into English in 1992, Red Sorghum is a bandit-laced tale about the trials of life for rural Chinese. The novel was made into a movie in 1987. Born in the eastern Chinese province of Shandong in 1955 to farming parents, Mo Yan is the pen name of Guan Moye. Mo was a teenager during the Cultural Revolution. For several years, he took various agricultural jobs and then joined the People’s Liberation Army. His first short story, “Falling Rain on a Spring Night,” was published in 1981. Many more short stories and novels have since been published. His latest, Life and Death Are Wearing Me Out, was written in 2006 and translated into English in 2008. Interesting! I’ve had Gabriel Garcia Marquez on my shelf for a few years now (The cover is so pretty, I just can’t bear to drag it along on my commute!) Now I’ll have to add Mo Yan to my shelf and hope to enjoy both soon. makes more sense than the peace prize they gave Obama a few years back. What does Thomas Pynchon have to do to win one? Or Leonard Cohen, for that matter? Perhaps stopping being white may help them.